Once there was a garden there. 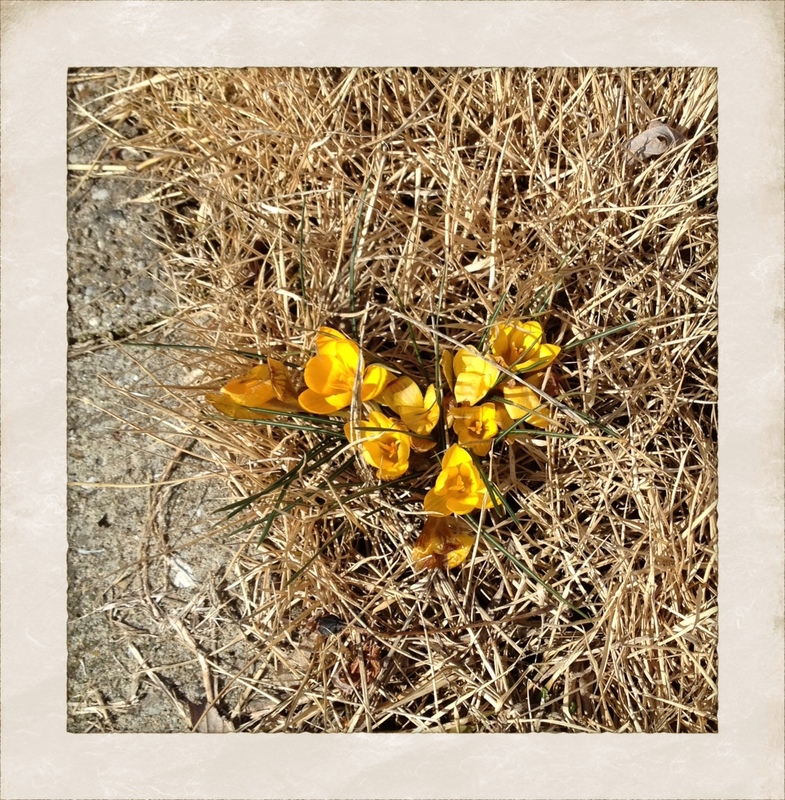 I caught a glimpse of it in the crocuses blooming in the winter-weary lawn. The garden is gone, for the most part, but I could see the shadows of where it once was. I could tell that at one time those crocus blooms weren't in a lawn but were part of a flower border running alongside the walk-way to the front door, a flower border that someone planted and tended. Once there was a garden there. I remember seeing it years ago. Last weekend I was near where my Mom grew up, where my grandmother lived for most of her adult life. Once there was a garden there, too, and I wonder sometimes how much of that garden still exists today, forty years after my grandmother's death. I remember the lily-of-the-valley and the old fashioned August lilies along the side of the house. I can see in my mind the big old apple tree that was just a few steps from the back door. I remember collecting the seed pods of the catalpa tree and picking the violets that grew in the lawn. Once there was a garden there with a snow-ball bush and white-blooming spirea and perennials, including mums and phlox. I thought of driving by to see how the house and garden look now - it was just a few blocks away. But I didn't. Sometimes it's better to just remember that once there was a garden there, and imagine that it is still there today. It is somehow nostalgic and sometimes happy or sad, but remembering an old garden brings back memories of everything that the garden represented. It's good there were not some teardrops that went with it. Now i remember the area of my grandmother's, where my mother once has been and we were always playing with my cousins. And there were many good and death memories there including my uncle and aunt and my cousin. Once too, there was a garden there! You are wise beyond your years, Carol. Things are never as wonderful as they are in our memories. Keep those pictures of apple trees and snowballs pristine. It is sweet to see flowers blooming long after the gardener no long tends them, and little bit sad, but so goes life. You love of gardening may have been tweaked by the garden once there. Those yellow crocus do seem to be very long lived. This reminds me of when we first moved to my former home. The "lady of the house" had been a gardener, but she died a decade or so before her husband did, and he just kept the lawn mowed and that was it. But I could tell, as you did, by the presence of bulbs, that there used to be a garden there. I removed the sod growing close to the house, and even before I could plant things, flower seeds sprouted. My parents are gone now. the large garden they tended are gone. My dad had a huge vegetable garden tnat he tended so lovingly is a mass of weeds. My mother was the flower gardener. all of her plants are overgrown. Apparently, the people that bought their house are not gardeners. It's so sad! That is a lovely post Carol. I think the garden is an extension of the gardener and when the gardener is gone the garden is often gone too. You may have been smart to skip the peek at the old place...I stopped to see my husband's grandparent's old house once and could have cried at what little was left of a lovely garden. A garden remembered never quite ceases to exist, I think. I hope. And if you HAD visited that garden and it looked very different, I suspect you would have seen a vague, ghostlike image of the remembered garden, super-imposed on the new reality. That's how I feel when I visit my grandmother's old garden at the farm, now owned by my aunt and uncle who have far less time, what with full time jobs and all. Yet the remembered garden is still there, and if I squint my eyes it's almost as if I can see it clearly and smell the evening primroses that used to surround the terrace. I don't know exactly why, but this line from Gone With the Wind popped into my head as I read the last line of your poignant post. I live out in the country and it is poignant to see cellar holes where a lilac still blooms, or a clump of daffodils - or even a rose bush. Yes, the memories are often better than the reality. I think you were wise not to drive by, Carol, but keep those precious memories of your grandmother's garden intact. 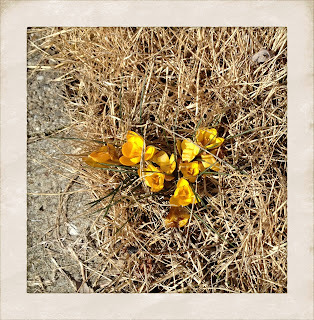 When I see irises and daffodils blooming in random places along farmers' fields, I often think of the homes that once must have stood there and the gardeners who lovingly tended those gardens. It's a bit sad, but sweet at the same time to think the legacy of a garden often does live on. Thank you for sharing your past with everyone. I remember helping my grandmother in her garden during my childhood. We were so happy to spend in her enchanted space. My grandmother is gone now but her garden is still thriving due to the deligency of my aunt.